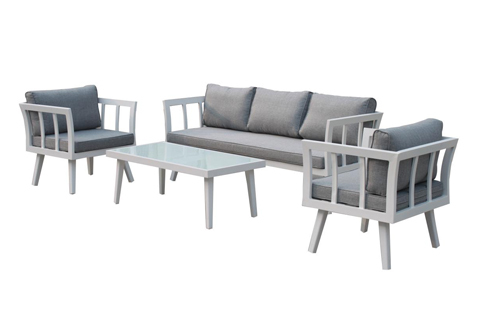 Foshan Darwin Furniture has been established from 2004. Quality is our culture! Our products have been popular in Netherlands, Italy, Germany, Denmark, Spain, USA, Australia and Turkey. We consistently deliver the finest in designer furnishings to the hotels, resorts, pubs, clubs, restaurants, cafes and so on. Our culture is dedicated to delivering innovative design,superior service,quality products,and the most important,we can supply you with the experienced service for the projects. 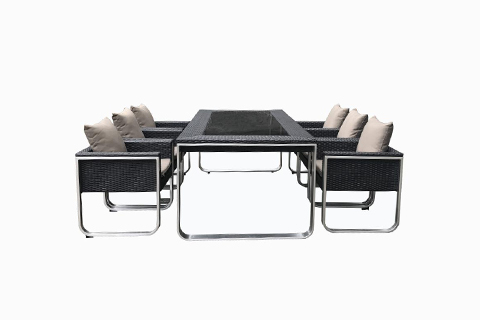 Where has Darwin outdoor Furniture,where will be full of leisure! This premium dining set is made of brush aluminum arm chair and black silk print glass top dining set. The leg is KD design with easy assemble technique, bring you and your clients convenience. The combination of brushed aluminum and wicker make your house modern and fresh. Sitting down in this pieces you will know that not only looks good, but also comfortable. The essence of modern design, the Infinity sofa expressive shape can take relaxation to a new level, it looks likes a basket, and bring back to cradle of childhood and let you feel safe. The sofa uses premium quality material including powder coating aluminum frame that brings a level of comfort and built with style and relaxation in minds. All pieces are made out of durable aluminum and premium cushion, won’t rust, peel, rot or decay.